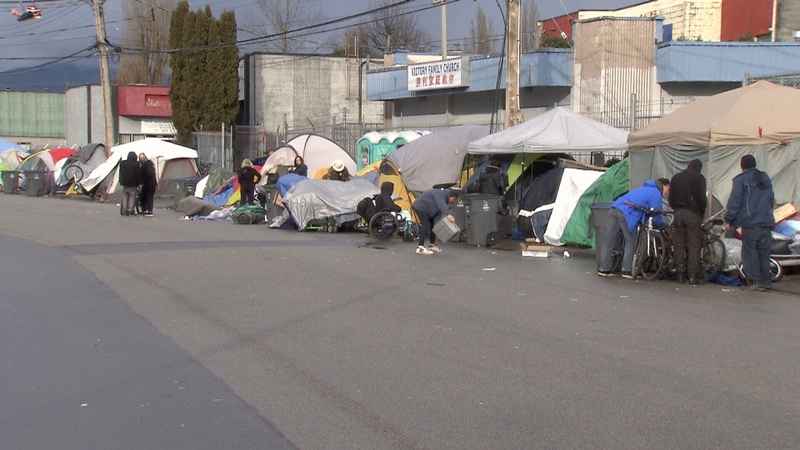 A stretch of road in Surrey's Whalley neighbourhood has become so overrun by homelessness, drug use and crime that businesses are being forced to pack up and leave, a local mechanic says. "It's a nightmare for any business to come across the stuff we have to deal with on a daily basis," said Paul Chen, who runs Centreline Auto Repair, located on 106 Avenue at the end of 135A Street. About 130 people live in tents on a section of 135A Street known as the "Whalley Strip" or simply, "The Strip." There, much like on Vancouver's Downtown Eastside, the region's opioid epidemic plays out in plain sight. Paramedics responded to more than 570 overdose and poisoning calls on the Strip last year alone. "It's pretty bad. We continue to see a rise in the number of people that are both losing their lives and are just overdosing, but we try to keep that number to a minimum," said Jacob Lee of St. John Ambulance, a volunteer group that helps paramedics and firefighters respond to overdose calls. Lee said breaking the vicious cycle of homelessness and addiction that has gripped many of those living on the Strip will require patience and understanding from everyone in the area. "This area is a community that needs support," he said. "It's a community that's forgotten about by a lot of Surrey and a lot of the Lower Mainland." But the situation isn't just taking its toll on the homeless. Since moving his business from Newton to Whalley three years ago, Chen said he's had to deal with theft, property damage and harassment from those living in the area. The fence surrounding the business was broken on two occasions. Last year, his U-Haul truck was stolen. Chen said he's had at least four confrontations with those living near his shop, during which he's faced harassment and racial slurs. "I just get frustrated by those people. Who gave them the right to do that?" he said. "I'm just trying to make a living out here." Chen said he's also losing money because customers are too scared to come to the area to have their vehicles serviced. For some business owners, the cost of the damage and loss of revenue is too much to bear. Chen estimates that 17 businesses in the area have shut down in the past year alone. Local officials say they're working to help both homeless people and businesses on the Strip. "We liaise with the businesses on a constant basis to ensure we are doing everything we can," said Surrey Public Safety Director Terry Waterhouse. The city and the province have announced $13 million to build three modular housing units for Surrey's homeless. The city also says another 250 units will come online later this year which will be transitional housing. Some of the people living in tents however, say modular housing is an inadequate solution they are unlikely to be part of. "It's putting lipstick on a pig," one man told CTV News. "The housing isn't designed to get people out of here…It's not a place where they're setting up to offer recovery. "It's a trap. It seems like every time you screw up, you end up back here." Chen, however, said that even if the city were to get people off the street, crime and drug use would still hurt businesses. "It doesn't solve my problem. It's still the same people living around here," he said. "They're going to still come affect business around here. It just looks better for the city." The mechanic said business owners have contacted the City of Surrey on multiple occasions to ask for a solution. "This is crazy. The city is ignoring us completely. I'm just a regular citizen trying to tell you to help me, so I can operate my business--so I can survive," he said. "They only have a solution for them, but they don't have a solution for us. They only tell us to stay put and pay our taxes and that's it."